Above you see a picture of the old "home hole" at Tacoma. The route depicted is pretty much what every player chooses as they face their second shot on this shortish par 5. Currently the shot up the middle makes the most sense. You can hit up this gap from almost any position, and since the shortest distance between two points is a straight line, why wouldn't you hit up the gap? Contrary to the obvious route of the current "home hole", the new "home hole" at Tacoma will require some decision making. Check out the diagram below. Immediately you should notice that first of all the shot up the middle is no longer easy, and the fairways of #9 and #18 merge into one very wide fairway at one point. This new open area is really not new since up until just 20 years ago, it was always an open area. If you were on the property this week you would have noticed that we made some significant progress toward returning this area to open fairway terrain. In order to open this area up, the giant sequoia shown here had to be removed. This tree was planted in the mid 1980's and really doesn't belong. First and foremost, the giant sequoia is not a native tree to our region so it should have never been there in the first place. Secondly, why was it ever planted? For almost 100 years, this area was open so why shouldn't it be left open? Anyway, you can see that now it is gone and once again, this area is as it was for almost 100 years. Now lets discuss how this impacts the strategic play of the "home hole" at Tacoma. Again, the shot up the middle is no longer an open run up. The bunker has been shifted to the right and rough has been added on the ridge so that there is two possible landing areas. Check out this diagram. 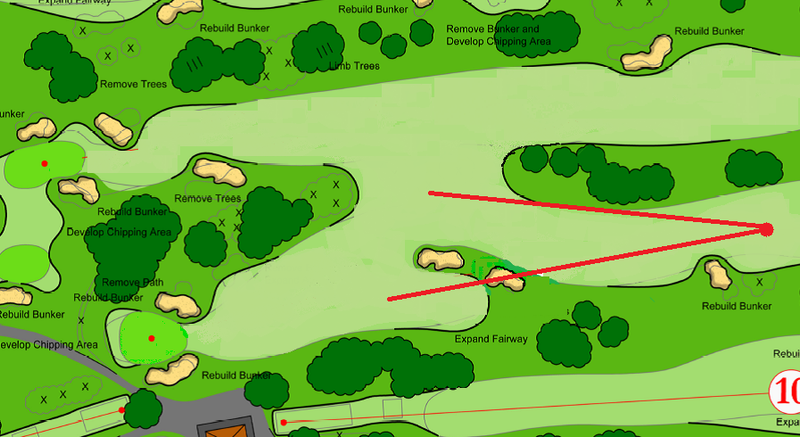 If you hit your tee ball to the middle of the fairway, you could go straight toward the hole with a pretty simple shot over the bunker or hit it to the right in the newly restored open area which is even an easier shot, but from there to the green, you have a more difficult angle and it's uphill so your ball will be coming in lower and it will be harder to stop it. Look here at the shot from the newly restored open area. You can see that although you have an open shot, is is not the best place to be for approaching this green. Now look at what you see if you hit it up the left on top of the ridge. From here you can really see the green, and that this approach shot doesn't require a carry over a bunker. This is clearly a better place to be, so it will be very tempting to try and get it up on this little plateau if you want to make birdie. So there you have it. 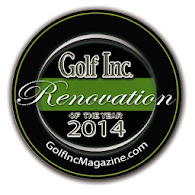 The secret to playing the new "home hole" is really no secret. All you need to do is hit a drive up the middle and then hit your second shot up top on the left. Anyone can do it...................but you must tee off from an appropriate tee for your game! If you insist on teeing off from tees that are too long for you, this hole will really give you some trouble. On top of that, if you don't hit your tee shot in the middle of the landing area, you're choice for your second shot gets much more complicated. Check it out. 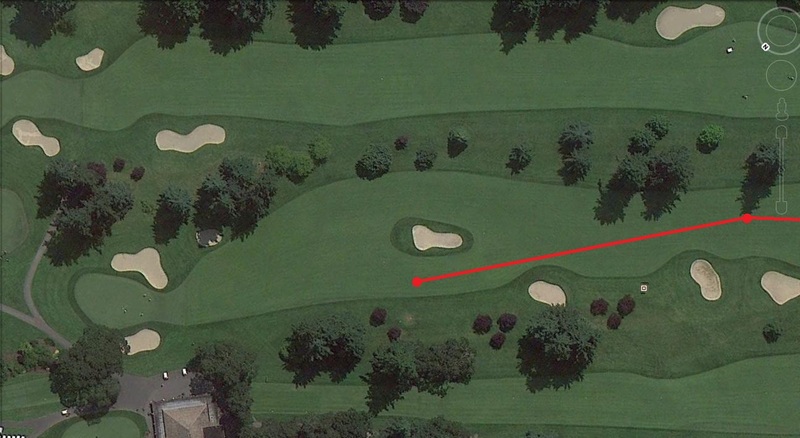 If you hit your tee shot right of center, the bailout to the right is much more difficult. The obvious choice is to just commit to one last good swing for the day and hit it up the left. The reward warrants the risk. So now what if you hit your tee shot to the left? From here, hitting it to the right is just too easy and everyone will probably think less of you (if that's possible) for choosing the easy way out. After all, now the shot to the left on top of the ridge is a mere 130 yards and from up there you are certain to make birdie, win the 2 bucks and the bragging rights. Here's how that shot looks today. No sweat .....................right? Well when the bunker sand is installed, this shot will look a little more difficult but I think you get the point. It's funny how golfers think. I mean really .................playing the new "home hole" at Tacoma will be very similar to living life in general. The shortest route to success is very often the most risky. The easier, longer way which takes you around the hazards, is definitely safer. What kind of person are you? Are you the risk taker that loves the feeling of a birdie so much that taking an occasional snowman is acceptable? Or are you a safe person? Are you content taking par every day because you just don't feel like you can handle the hazards? I confess, I'm the fool who will go for it every time. But I have nothing to loose, except maybe a couple of bucks. I'm not very good at golf and I'm okay with that. The interesting thing will be to see what someone does here when there's a lot on the line. Maybe you're standing here "one down" during the final round of the Club Championship, and your opponent has just hit a perfect drive a few yards beyond you. You're up...................what will you do?